I bet that 8 out of 10 people have traveled during hurricane season and didn’t even know it. The hurricane season lasts 6 months out of the year and covers some of the busiest travel months such as June, July, August, and November. Hurricane season is something we cannot avoid, so we might as well learn how to safely and comfortably travel during this time. In a Travelmarket Report, author Cheryl Rosen has compiled tips from various travel agents that we can apply in our own travel making decisions. In addition to her report, which you can read here, (Seven Tips for Traveling During Hurricane Season), I have 3 more tips to share! Do your research. Along with checking the weather on your phone, which is practically a habit now every time I go on vacation, find out what your airline carrier and hotel will do if there is a hurricane. Will you be compensated or looked after? Be aware of potential hazard weather conditions by subscribing to flight notifications, downloading weather alerts on your mobile device, enrolling in STEP, and staying updated with the National Hurricane Center. 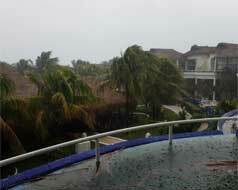 Find out if your travel destination is within or outside of hurricane prominent areas. Don’t Freak Out. Every storm is different and may often be small and quick. Whether a storm is brewing or not, staying calm is the best thing you can do. It may help to create an emergency plan for what you would do or who you would contact if a major storm did occur. However, you may end up having perfect weather the entire time! The choice is yours. It is your choice whether or not to travel during hurricane season. If you don’t feel comfortable traveling during this time of year, that is ok! There are six other months you can choose from. If you still want to travel during this time, just prepare ahead of time. Consider choosing a vacation stay that avoids the hurricane storms altogether.